Today we’d like to share a few recipes for fresh, seasonal snacks. Crackers and spread are such friendly, unpretentious food – they allow everyone to customize and create their perfect bite. These crackers are crunchy, nutty, and subtle enough to accept a variety of toppings. The two spreads are created with eggplant, peas, and cauliflower, which are abundant during these hot months of the year. 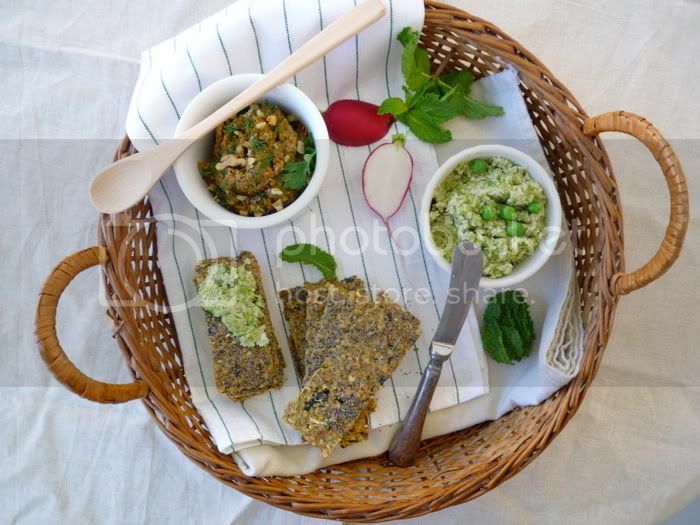 We have a nostalgic attachment to green peas – to us they symbolize the barefoot freedom of childhood summers. Combined with the cauliflower and Indian spice blends, which we got during our recent trip to Toronto, the peas take on a new aromatic quality. Toronto is a true mecca of Indian food and these spices can be found in any of the numerous Indian markets in the area. When there, we ate Indian for nearly every breakfast, lunch, and dinner. These crackers and spreads will do well for an afternoon nibble or a light meal together with a tossed salad. In a bowl, combine the ground flax and water and let sit until the water is absorbed. In a food processor, pulse the zucchini into small pieces and add to the flax. Chop the nuts in a food processor until finely ground and add to the bowl. Add the chopped mint and mix thoroughly with your hands. Spread on Teflex sheets. 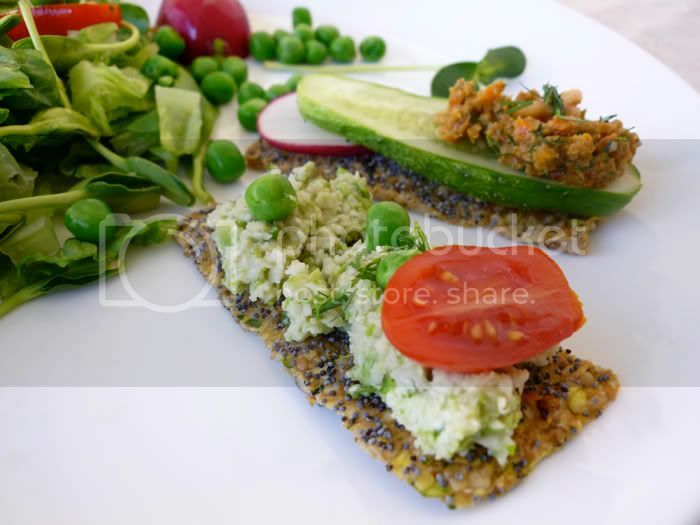 Sprinkle with poppy seeds and embed them into the cracker with wet hands. Dehydrate at 115F for 6 hours. Remove the teflex sheets, flip, and dehydrate for three more hours. Cut into desired cracker size, and dehydrate for 11 hours or until crisp. Keep refrigerated in an air tight container. In a food processor, pulse the cauliflower to make small pieces. Put the nuts, spices, ginger, lime juice, and water into a blender and blend until smooth. Add salt and pepper. In a shallow dish, combine the cauliflower, peas, and the blended nut creme. Dehydrate at 115F for 2 hours, mix occasionally. Place the mixture into a food processor and blend until spreadable but with texture. Place into a bowl and mix in the mint or cilantro. Keep refrigerated in an airtight container. Mix all the marinade ingredients together in a bowl and set aside. Put the sliced eggplant into a bowl, mix with 2 teaspoons of salt, and let sit for 30 minutes. Rinse with water and gently squeeze out the extra liquid. Place the eggplant into a shallow dish and pour about 2/3 of the marinade over it. Mix thoroughly. Place the dish in a dehydrator at 115F for 6 hours, mix occasionally. Pour the rest of the marinade over the sliced bell pepper, mix, and place in a dehydrator at 115F for 2 hours, mix occasionally. To intensify the flavour of the tomatoes, dehydrate them 115F until they shrink a little. After dehydration, drain the excess liquid and put the eggplant, bell pepper, and tomatoes in a food processor and pulse until roughly chopped. Add the tahini, pepper and salt (if needed), and blend until smooth. Transfer to a mixing bowl, add the dill, walnuts, and the remaining garlic. Mix and store in a refrigerator in a glass container. How appetizing and beautiful to look at. your ingredients always look like they’re fresh out of the garden. Love the idea of healthy crackers instead of the standard fare from Nabisco. I just baught raw food real world and I have the cauliflower recipe bookmarked! It looks delish! Our peas in the garden are just starting to get big and juicy so I think I will use them in this recipe :) Thanks! Mmm! 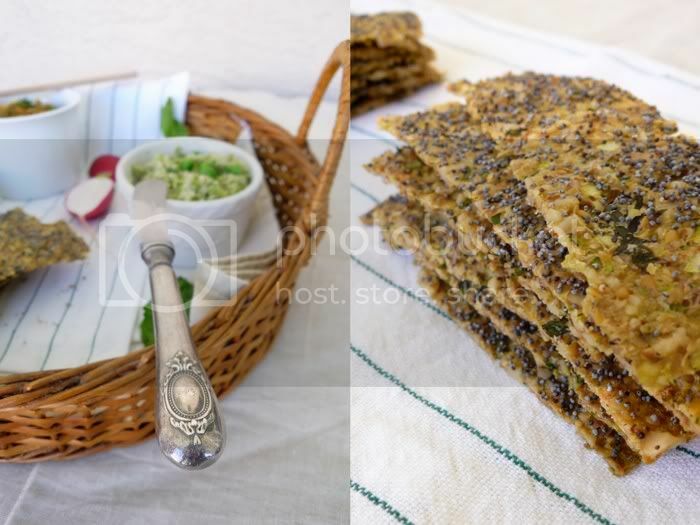 I’m going to have a birthday party sunday, so I deffinetly adapt your recipes including your spicy flax and herb crackers. Don’t you sprout the peas? I like them raw, but considering it’s effects on digetion isn’t is better sprouted? What I call Vitamin L, LOVE! Wow these are really lovely pictures! Very inspiring! ahh, you’re pictures are just fabulous! I made pea-pesto last night, but now I think I’ll have to try this pea cauliflower salad (and it looks so lovely on your crackers)! Oh my goodness,,,,,,,,,,,,,,this looks positively yummy, scrumptious, and delicious!!!!! The way that you arrange all of the great food, for the taking of the photos, is absolutely outstanding!!!! i really need to try that pea spread! i love indian food and the spices sound great. Coco: You grow your own peas, that’s so cool! The recipe is truly worth a try. Norka: Is it your birthday? In that case, best birthday wishes to you! I usually only sprout dry ingredients. Anne’s Kitchen: Thanks so much! Callie: Thank you. 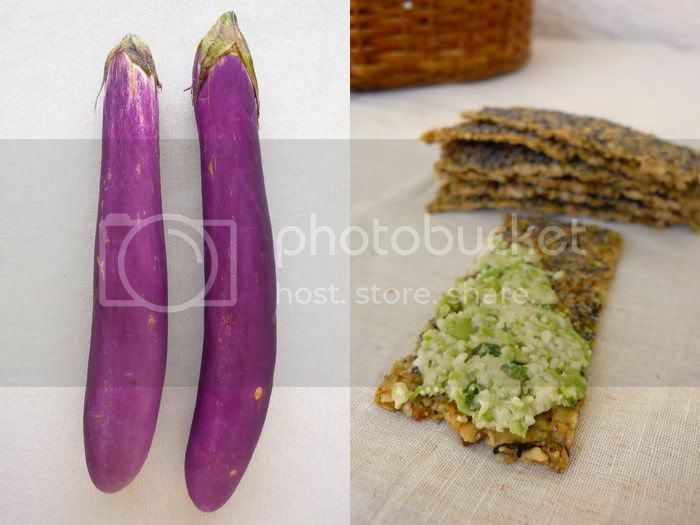 The pea spread is lovely, but I have to say that the eggplant is just as delicious and worth trying. Bitt: Thanks! The spices are amazing. Thanks for the wishes! I’m going to be 30!!! I feel like all is beginning now… The crackers are done! Fabulous! I tried the pea spread and it was just awful. I know it is mostly Raw Food Real World’s inception. Maybe I did something wrong. I also realized I can’t digest cauliflower at all even though I stomached the dip as not to waste it. Bitt, so sorry to hear about your bad experience! I wish I knew what went wrong. I’ve made the spread many times now and enjoyed it every time. It’s actually a favourite of my two year old and husband, who is not even vegetarian. The only thing I can think of is maybe the spices were stale? You are such a talented food stylist; I love your work! I’m curious about trying the crackers but baking them at my oven’s lowest temp; I’ll have to think about just how to do it, but they look so good. I love that they have zucchini as an ingredient. I saw this recipe when I first stumbled upon this blog and it was probably the starting point for me moving towards raw food. 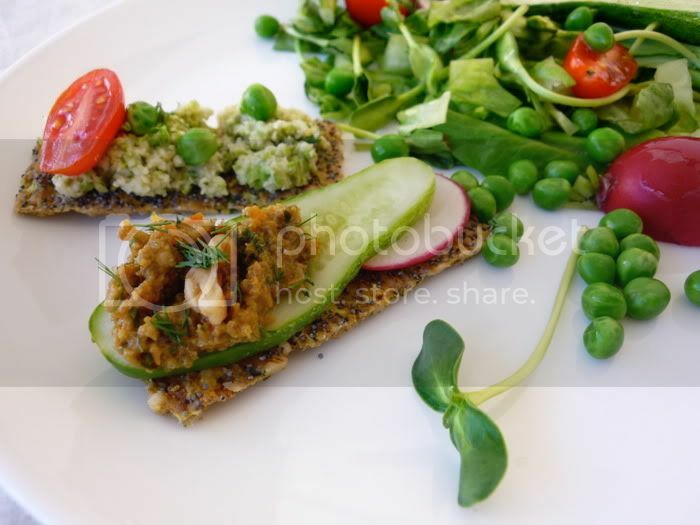 Before your lovely blog, I thought of raw food as salads and fruit slices (not to interesting for anyone, let alone someone who loves food and cooking) which I have now come to learn is only a very small fraction of the whole. Now that I have an excalibur I was finally able to make this yummy recipe, loved it and have now been playing around with different toppings. 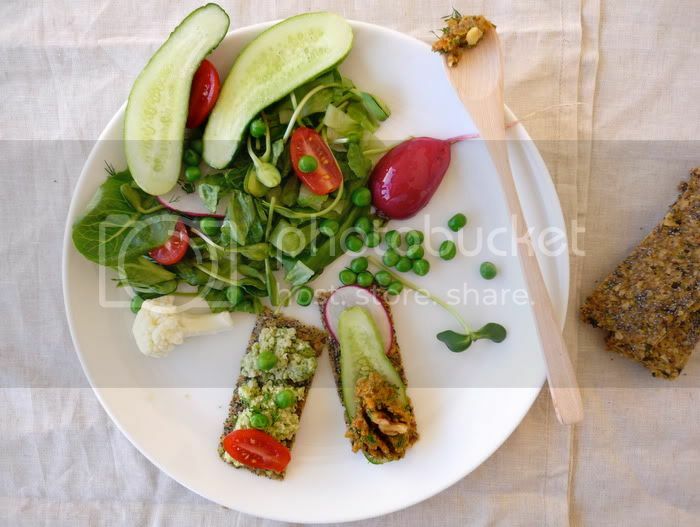 Thanks for the great recipe, and showing people there is so much more to raw food!